Ukrainian Armed Forces incurred no losses in combat yesterday, but five troops were wounded, informed the spokesman of the Ministry of Defense on ATO related issues Colonel Oleksandr Motuzyanyk at a press briefing at Ukraine Crisis Media Center. Russia-backed militants violated the armistice 10 times in the Luhansk sector, using mortar launchers in the vicinity of Troitske twice. Ukrainian troops registered militant sniper’s activity in the same area. 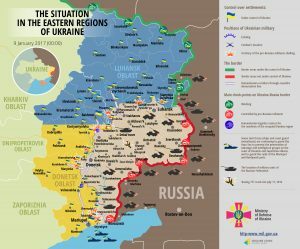 Russia-backed militants shelled Ukrainian positions from various grenade launchers and small arms. Moreover, two armed provocations were registered in Stanytsia Luhanska and Lopaskyne on the left bank of the Siverskyi Donets River. Militants conducted 11 attacks in the Donetsk sector, and five of them involved use of heavy weapons. The militants used heavy arms in the vicinity of the Svitlodarsk bulge, north outskirts of Horlivka and Avdiivka industrial area. Moreover, they shelled Ukrainian troops from weapons of armored personnel carrier. In the Mariupol sector militants’ made 30, eight of them involved use of heavy arms. The situation remains the most restless in the frontline area from Pavlopil to Shyrokyne, where militants opened fire from assault rifles and large machine guns. Later they used mortar launchers in the vicinity of Hnutove, Vodiane and Shyrokyne. Militants delivered artillery attack at Ukrainian troops in Shyrokyne in the evening and shell a stronghold in Talakivka from tank two times. “Following this, occupants’ combat activity decreased and Russia-backed militants were using mostly small arms till the end of the day. Four cases of ceasefire violation involving use of small arms were registered in Mariinka-Krasnohorivka frontline area,” elaborated the spokesman.